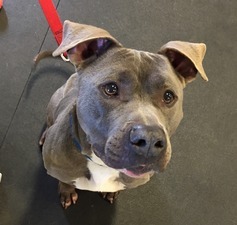 Robbins List - New Haven Events, Fundraisers & Deals - Pet adoption event, shelter fundraiser at Shell & Bones, & more news from the New Haven Animal Shelter! Pet adoption event, shelter fundraiser at Shell & Bones, & more news from the New Haven Animal Shelter! Our shelter has many wonderful dogs and cats waiting to join their new families. Please visit our Petfinder page to see our adoptable animals, or better yet, come down to the shelter to see our animals in person! Our hours are Monday through Saturday from 12:30 to 4:30. We will be closed to the public on Monday, February 18th for the Presidents’ Day holiday. We recently published our Fall newsletter! If you would like to read an electronic copy of our latest newsletter, please click here. 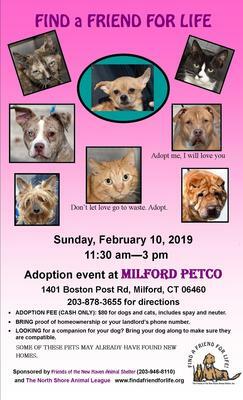 Please join us on Sunday, February 10th at the Milford Petco! We will be there from 11:30am-3pm. Please stop by if you can to meet some wonderful animals! Save the Date – Shell & Bones Fundraiser March 13th! 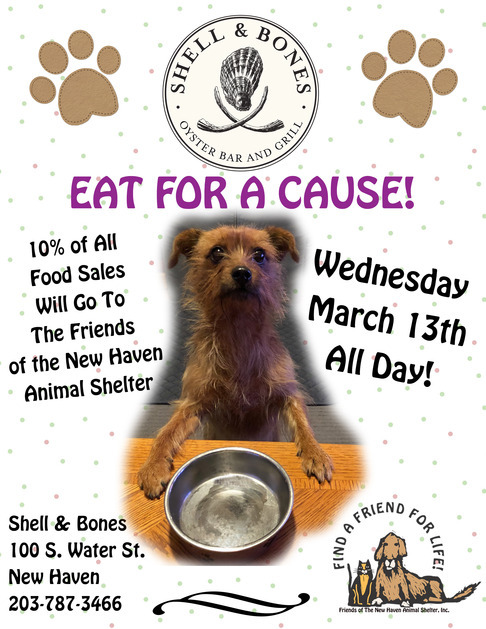 Shell & Bones (100 South Water Street, New Haven) is throwing a fundraiser for us on Wednesday, March 13th! Ten percent of all food sales that day will go to our organization. Please visit their website for more information about the restaurant and to make reservations! 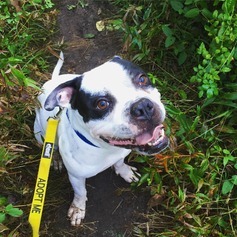 Scotty is a fun 5-year-old Boxer/Pit Bull mix. He likes going on walks and especially loves treats. Scotty gets along with other dogs, enjoys playing with stuffed animals and would love a new home soon. How can you not love this sweet face? Kiddo is a 10-year-old Pit Bull Terrier who likes to go on walks. 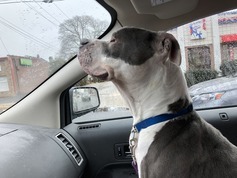 He also rides well in the car. Kiddo prefers to be the only pet in his household and can join an all-adult home. Here are pictures of Chloe and Dolly – two of our shelter alumni! If you have one of our shelter graduates as part of your family, we would love to hear from you and find out how they are doing! Please send any pictures and updates of your shelter alumni to fotnhas.info@gmail.com. Do you shop at Amazon? If you use the Amazon Smile website(smile.amazon.com/ch/06-1626182) instead, when you purchase eligible items, we will receive a donation based on the purchase price. Thanks to everyone who has supported us so far! 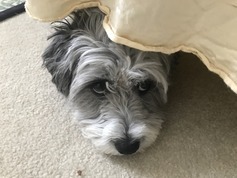 The Friends of the New Haven Animal Shelter maintains several social media accounts which are updated regularly – please follow us so you can see what’s going on with animals the Robin I. Kroogman New Haven Animal Shelter. Our Facebook page is @newhavenanimalshelter – please like us to keep up to date on our activities and adoptable animals! Our Instagram page is @newhavenanimalshelter . 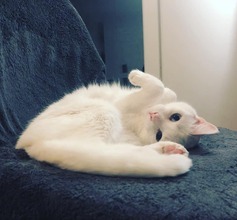 We showcase our animals with cute pictures and videos! Our Twitter name is @fotnhas . Please follow us to keep updated on our organization and our animals! Our YouTube channel is fotnhas . All of our adoptable animals have videos that you can watch on our channel. Your donations play a big role in keeping our animals adoptable and healthy during their stay at the shelter. The funds let us take care of cats and dogs like adoptable Scotty. Please think of us when you are making your charitable donations! Thank you again for your support. If you would like to donate to our organization, please visit our Amazon Wish List or contribute by mail or Paypal. We are an all volunteer 501(3)(c) organization, so all donations are tax deductible.